Yes, this is another one of those posts. I’m not sure if I agree with this characterization. In the book A Clash of Kings, the source material for Game of Thrones season two, the Tickler — the torturer nicknamed by nine year old narrator Arya Stark for how he ‘tickles’ his victims — is depicted as a sociopath who enjoys his work. As I perceived it, Sunday’s show went a different direction with the scene. Here the Tickler’s only half interested in his victims; as Rosenberg notes, he asks all captives the same questions even if it’s obvious they don’t know the answers, and he’s just as focused on eating his pear as their screams. Torturing is just a job, and’s as routine as any job can be. The Tickler and the other Lannister soldiers don’t have enough of an emotional investment in their victims to really be said to “enjoy” torturing them, because they don’t see Gendry and the other smallfolk they murder as people at all. 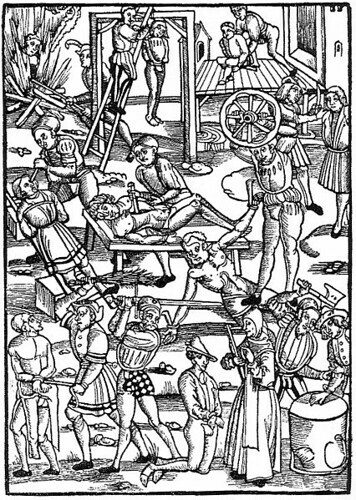 16th century depiction of torture. Via Wikimedia. The binary mindset of us vs. them is a necessity of medieval warfare. By the late pre-gunpowder period fortification technology had advanced to their point that capturing a defended castle required a long siege often more expensive to mount than it was worth. With frequent sieges prohibitively costly, wide scale devastation of the undefended countryside was an effective tool to coerce a fortified opponent into battle or, preferably, capitulation. Contrary to romanticized perception of medieval warfare as knightly combat, atrocities against the peasant populations were widespread, and when garrisons that declined to surrender were captured they were slaughtered to disincentivize future costly resistance. This type of normalized brutality requires viewing the target population as less than human. Game of Thrones doesn’t draw the line between characters who behave like human beings and sociopaths — casual brutality is unquestioned by nearly everyone, and that what makes it so harrowing. Link to video via Sullivan.